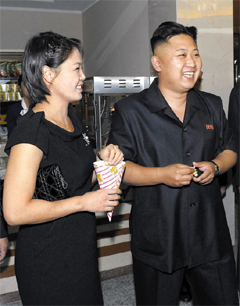 Rumors are circulating in North Korea that Ri Sol-ju, leader Kim Jong-un's wife, is pregnant, the Daily NK reported Monday. North Koreans began speculating about her pregnancy when they saw footage of her on state TV in September, according to the online daily. Ri does look plump with a slightly protruding belly in footage of her and Kim visiting an apartment complex in Pyongyang on Sept. 4. "She was quite slim in July when she made her first public appearance but seems to have put on some weight in August and September. But whether that really means she's pregnant is impossible to tell," a source said. Kim and Ri reportedly have one child already.